Meet Frank. When you shake his true-to-life hand, you will be amazed at how naturally he moves. 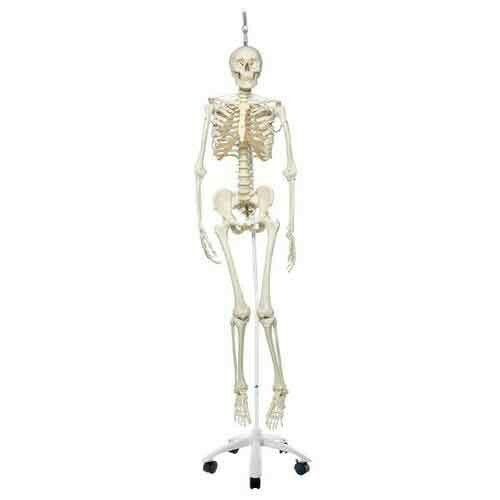 Frank the Functional Physiological Skeleton Model, introduces students and patients to the body's complex framework. As 3B Scientific's top-tier model, Frank's uniquely detailed joints interplay with the carefully crafted limbs for almost-life-like movement. For example: Frank clearly shows the position and relationship of spoke bones and ulna during forearm rotation. Frank's accuracy stems from the manufacturer's partnership with John Chester M.D. -- a renowned expert in the interdisciplinary study of thought and movement. Frank can show the position of the knee cap when the knee joint is moved. His flexible spine shows natural movements including lateral bending and rotation. Moving Frank's pelvis demonstrates the fine articulation of the sacroiliac joint and the sacrococcygeal symphysis. This precision makes Frank ideal for giving physical and sports therapy patients a thorough understanding of their prescribed treatments. For quality and longevity, Frank's 200+ bones are cast in nearly unbreakable resin and hand-painted and -assembled by German artisans. This ensures that Frank will hold up to years of careful inspection by medical students, kinesiologists, chiropractors and medical engineers alike. Faithful reproduction -- Frank has a three-piece skull with individually inserted teeth, as well as articulating feet and hand bones that are naturally positioned. 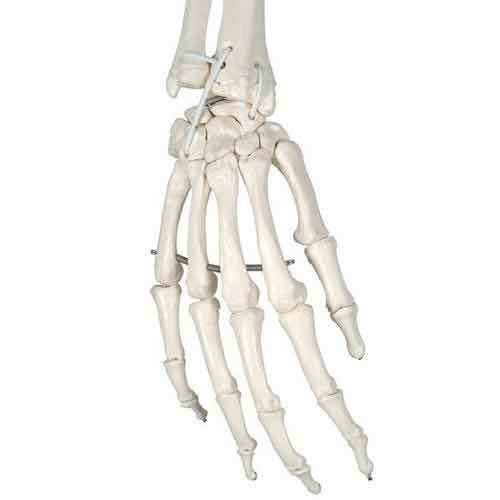 The bones for Frank's hands and feet are carefully wired to show natural positioning. 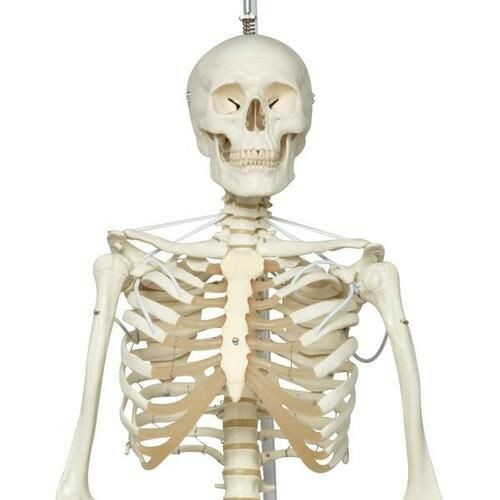 Accurate -- The life-sized bones even have the same weight as real bones at approximately 21.10 pounds. Unlike real-life, however, Frank's limbs are easily removed for closer study. Guaranteed quality -- Final assembly and hand-painting of the unbreakable synthetic bones give the manufacturer the confidence to offer a three-year limited warranty. Class-room ready -- Frank's wired frame is ready for display on a standard 6'3" metal stand that is also equipped with five casters and a see-through dust cover.